Celebrations! This is a more open ended theme for your map; there's a variety of ways you could end up incorporating this into your map. The execution of it is going to be key. There's a fair bit of inspiration you can draw from real life, even. Just please don't submit a Festival Plaza remake. May Ultra Sun and Ultra Moon be it's last appearance. Your map cannot exceed 120x120 tiles. "If you're coming up with some sort of festival or holiday, think like someone who lives in the Pokémon world. How does it relate to the world around you? Don't be afraid to give it some backstory." Map: "Hoenn is once again holding it's grand festival but this time it's in Sootopolis City, Trainers & Coordinators from around the world gather here to duke it out to see who is the best!" 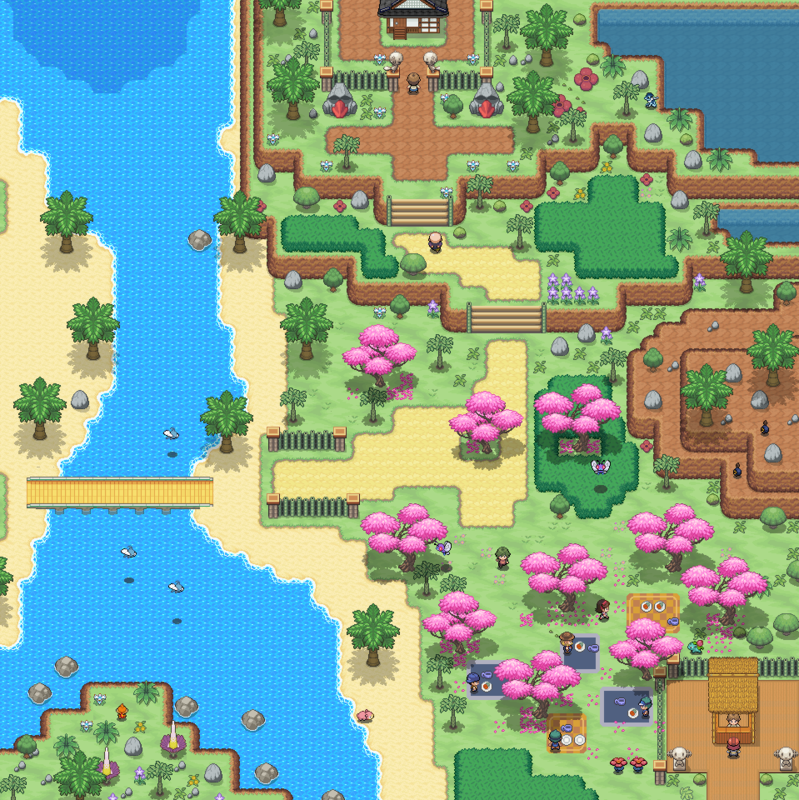 Notes: Once per year, the people of Cerulean City host a ceremony at Cerulean Cape where Trainers release thousands of flowers into the ocean. It is an old tradition that is believed to make the Prince of the Sea happy, bringing luck to those who participate. 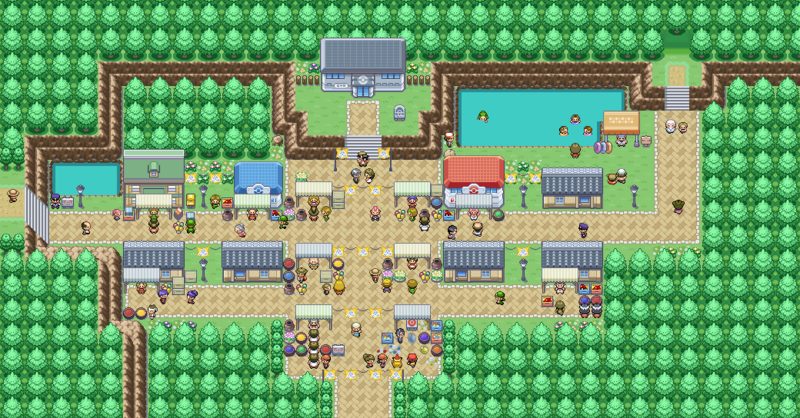 Over the years, the event has attracted all sorts of Trainers, as well as traders and merchants from across Kanto. Flavor text: Ahhh It's that time of the year again... at the start of each Summer, dozens of ships with brightly colored sails will sail through the strait. It's an age old ceremony originally to pray for the ocean's blessings. Even though much of the symbolism has been lost over the years, the festival still is as popular as ever. Sundry goods and freshly caught fish are being sold all over town. And even though the rocky coast doesn't allow for any beachgoers, tourists still flock to the small town witness this unique sight. Notes: Oof, this was probably the toughest challenge so far. Deciding on a theme is pretty difficult when you don't have any specific tiles at your disposal. I wanted to do something summer related, but my initial few attempts didn't quite worked out. In the end I decided to edit and recolor some tiles, so I could give the map more flavour. The tileset isn't finished yet, but if anyone desperately needs them, I can post them. Notes: According to Bulbapedia, the Pokémon Exhibition is; "an annual festival held in Florando. It is a gigantic outdoor Pokémon entertainment festival where Pokémon Trainers and Pokémon come from around the world to put on shows and perform. This venue is why Florando is famous." 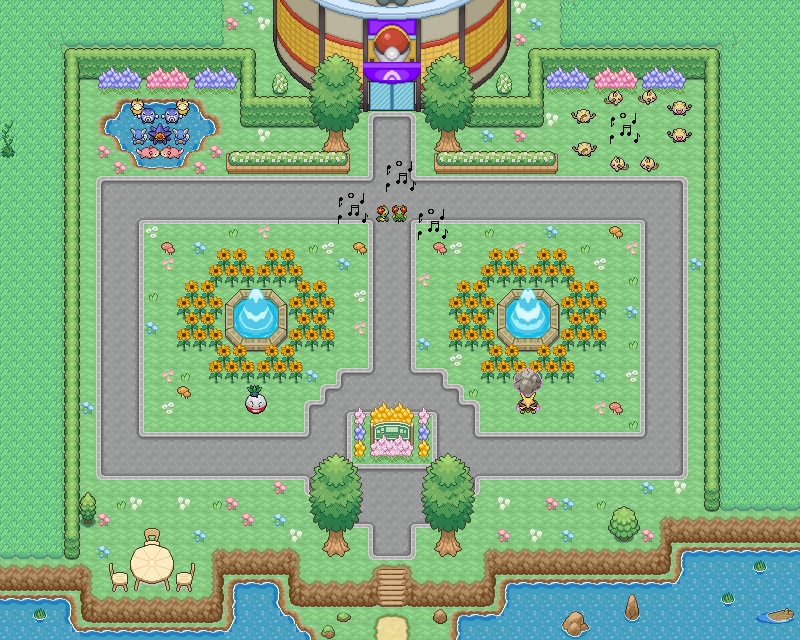 The Pokémon Exhibition appeared in Episode 122 (Flower Power) of the anime. I thought about doing something original but I literally only had one day to edit and make this map so I went to the first thing I knew had lots of Pokémon stuff that isn't in a game; the anime! 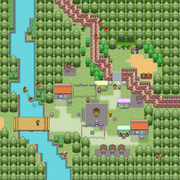 I wish I could spend more time on the smaller aspects of the mapping process and clean it up more with some trainer sprites, but I just didn't have enough time. Glad I participated and can't wait to see more maps roll in! Best of luck to everyone! Credits: Spherical Ice for tiles and over-worlds. Notes: What an occasion! It's all smiles in Jubilation Town as they celebrate Victor's 30th year as the Gym Leader. Visitors and past challengers have come from all over to congratulate Victor on his achievement. The town have set up banners, stalls and shops for the attendees to explore. Victor can be seen by the steps of the Gym giving an interview. It's spring. The sun is shining, it's warm, flowers bloom and a soft breeze spreads their pleasant smell, mankind feels the urge to go outside and the annual spring market in the park on Flower Mountain takes place. People from all over the region go there to see the amazing environment and go shopping. Flower Moutain spring market has lot's of unique goods. Most popular are the beautiful, fragrant flowers and the honey that is produced from their sweet and pure nectar. There are also quite a few medicines and other products that are made using the herbs that prosper on the rich ground of Flower Mountain. Sadly I didn't find a script, that takes map pics with the bush tag beeing applied properly. Notes: Celeaf is a very old city, with ancient trditions, among these is its well known Atumn festival, an annual festival gathering people from all across the region. Painters come to show their skills, scientists come to investigate the local environment, merchants come to sell their exotic products. There is stuff all around the place, people playing together, old inhabitants happy to see that the city still atracts a lot of people, a café offering special menus, and an over all really enthusiastic atmosphere. 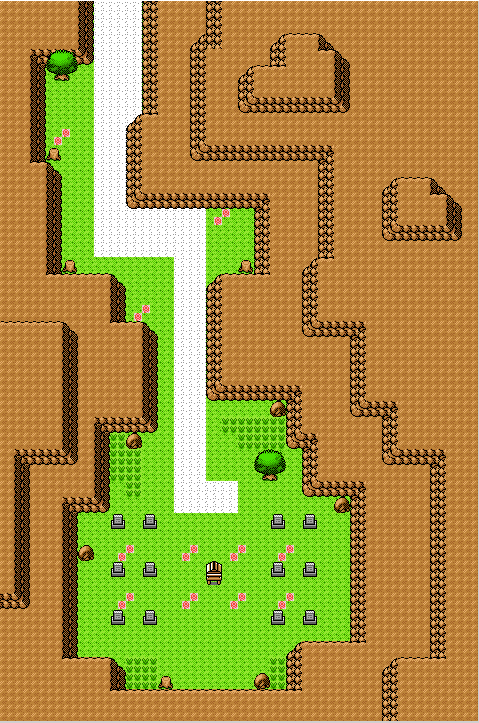 Used Photoshop and Pokemon Essentials to create this map. Notes: A small village found in the mists of a forest. It's centered around its rich environment loved by bird pokemon. People and bird pokemon that lived nearby came together and lived in harmony. Passerbyers and local villagers come together to celebrate its anniversary of the Golden birdhouse shrine, dedicated to the magnificent rainbow-winged pokemon, Ho-oh, hoping that it would visit one day. 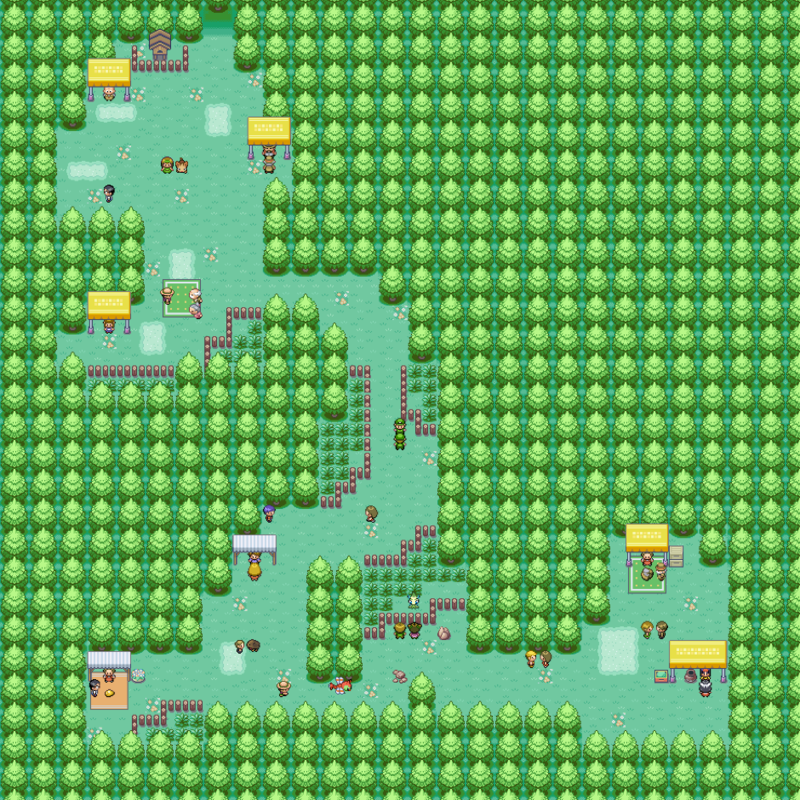 This is my first map, and it was quite a learning experience on how to create a map, and how it could visually fit in an actual pokemon game. One thing I sorta wished I could have done better was making the map bigger. Good luck to anyone else in this map trial! A long time ago, Wamu town was much smaller, and a Pokemon Professor called Professor Methuselah. In one of his crazy experiments he caused an explosion that wiped out more than half of this small town. The people of Wamu were distraught, but a young man by the name of "Menut" was not willing to move on, and so he sought after a way to undo what had been done. Menut followed up many leads, including the idea of resurrection, in which his plan was to find Ho-Oh and plead to it. It is not known how far he got but it did not work. And so he went after an alternative, time travel. Menut traveled to Chrok forest where he had heard of a Celebi resting there. It is not known how he managed to get the Celebi to listen, but the Celebi sent Menut back in time where he stop Prof. Methuselah. And so Wamu continued to thrive. In appreciation of Celebi, the townsfolk of Wamu hold the Festival of Time in Chronk forest. And so some towns people set up stands where they sell old trickets, some have a nice picnic within the forest, some go on adventures in the forest! Playing with their friends and Pokemon. Overall it is a fun time to be had, although, to make sure no one gets hurt, fencing is set up around the tall grass, can't be too adventurous! Notes: South of the town lies a somber resting place for loved ones. During the Day of the Dead celebrations, ceremonies are held to honor the passing of the ancestors who brought forth this region, and to bless the shrine in hope's that Ho-Oh will watch over their loved ones, and their region for the upcoming year. However many trainers come to each grave to pay their respects, leave flowers or a parting gift and have their own personal celebration. Thank you for your entries! I'll be reviewing them within the week and announcing the results when I've reviewed all options! Hopefully everyone enjoyed diving back into Iron Mapper with one of our most open ended trials as of yet! It was interesting seeing the different interpretations of the theme along with lore along with each map. Perhaps this trial has you considering how to incorperate more lore into the various locations in your own projects! As always, thank you to everyone who entered! Both of the maps here are pretty different! JaceDeane takes an existing location (but don't be fooled into thinking it's a 1:1 remake of it!) and gives it an interesting ceremony that ties into Manaphy. NoodlesButt manages to incorporate the hustle and bustle of a big celebration, yet keeps it feeling very cozy and local to the town! 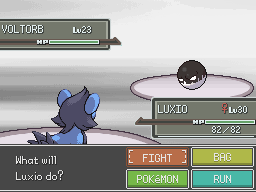 It wouldn't be a stretch in the slightest to imagine seeing both of these events in a Pokémon game! Kudos to both JaceDeane and NoodlesButt! - While we don't judge the maps based on tiles for the most part, it's worth mentioning that the scale of the tiles on this map feel very odd. You have tall grass that's as big as the door on the building. - There's rocks in the water on the south side of the map, but it would have been a slight improvement to put a couple on the north end as well since it feels rather empty. - The north part of the map with the building is fairly detailed, but the south side by the trees feels a bit empty in comparison. Granted you were clearly going for more of an open area there for the picnic and festivities. - The fence near the bridge across the river feels out of place considering how small it is, and that it really isn't separating that much. - While it was likely to break up the repetitive texture, it feels strange that a main road across the town would separate. - Having that ferry next to a bunch of sail boats does feel a bit out of place, if not just for the palette/style difference. Though it's understandable since it's presumably a ship with the tourists. - Interesting idea basing it off of the anime! - Having the tall grass fill the map border like that feels like a missed opportunity for including more of Florando. - While the source material does mention that it's a large outdoor area, it does feel a bit too large and could be either condensed a bit more, or have some more details in it to fill up some space. The vertical part of the paths feel rather bare. - Slight tile error: your mountain tiles that are on top of other mountain tiles have shadows, where as they should only have shadows if they're touching grass, sand, etc. - While it's an awesome idea for the map and the execution is almost nailed, the entrance to the area feels a bit dull. A fountain down there or even a stall wouldn't have gone amiss. - There's a lot of lamp posts, especially on the west side of the map... but there's none near the south entrance. - The map feels very large; you could reduce the size by at least a quarter, adjust the map, and it honestly wouldn't feel much different. - A couple houses that aren't enterable can be excused, but having an unenterable house behind the majority of every other house feels more like a space filler than thoughtful design. - For the most part, all the buildings look very similar and could use a little bit of variety from one another. - This is a really cute idea for a celebration. - While we don't judge based on tiles, the thinner trees' brighter green palette clashes with the other tree palette. They don't have to match by any means, but it's pretty noticeable here. - On the topic of the thinner trees, they do feel like they were just added to fill some space. You could remove them and there wouldn't be a huge difference on this map. - The very tall grass along the river feels off when it's in such small patches like this. - The shadows with the big trees are missing in some places, and misused in others. 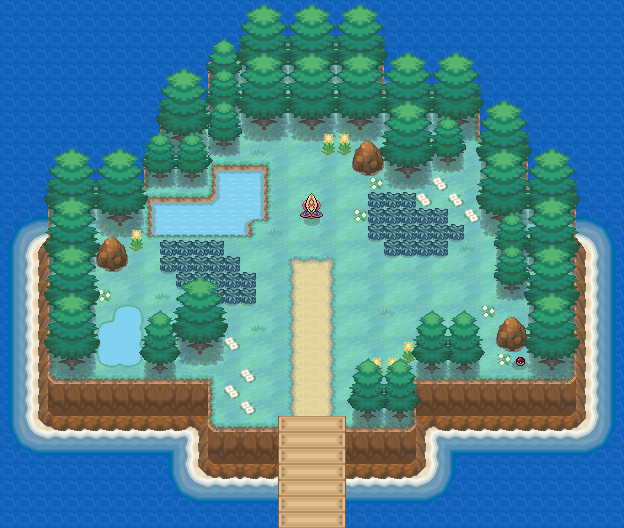 Have a look at some Game Freak maps from FRLG and touch up where you use them on this map. It'll help it pop a bit more. - This map is very large and could be condensed into a smaller map without losing much content or detailing. - There's a small handful of mistakes with your tree shadows, particularly on the bottom half of the map. - Fencing off the tall grass is a cute idea. - This map feels a bit more like a straight path than a forest. - The map description was just vague enough to get that there was a conflict before this and Cresselia has returned home, but it wouldn't be very immediate otherwise. - If there's enough rainfall for a puddle, perhaps another puddle or two wouldn't go amiss on the other side of the map.